Solomit has continued its long history of being a family owned business when it was purchased by the Wheatley brothers in February 2016. Previously Solomit Strawboard was acquired by the Turner family back in 1974, from a South Australian family company. The machinery and technology was then moved to the rural Victorian town of Murtoa, in the Wimmera grain belt region. Click on the links below to learn more about this interesting, historical town. 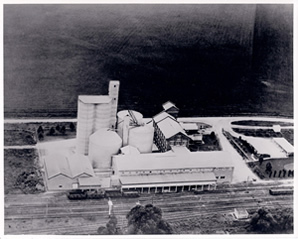 The site of the Solomit manufacturing facility at Murtoa is an historic old building, originally used as a flour mill, being located in prime wheat growing territory. The flour mill closed down some years earlier, and was purchased by the Turner family. The building was then converted into the manufacturing facility for both the Strawboard and Brush Fence products. Many current employees are long standing employees, having been with the company since production commenced in Murtoa, over forty (40) years ago! The plant is an icon in the region, and significantly boosts employment and supports the social infrastructure of this small town, having been severely affected by drought and economic hardship in recent years. Locals affectionately refer to the ‘olde mill’ as the mightly ‘Grain Complex’ – the silo’s being capable of storing up to 400,000 tonnes of wheat in its heyday … and it shares iconic status with one of Murtoa’s other famous landmarks – the Murtoa Stick Shed! Click here for a very interesting read: www.MurtoaStickShed.com.au.